This blog has always been focused on eczema, rather than allergy. However, I came across a very good book by Dr Wayne Shreffler and Dr Qian Yuan on ‘Understanding your food allergies and intolerances‘ and found that it clarified many food allergy concepts. Thus, this 4-part series is to share that knowledge with you! This week, I’m doing something totally unscientific – I’m compiling all statistics I find online on outgrowing allergies to lay out in a graphical representation of WHAT AGE will a CHILD (likely!) 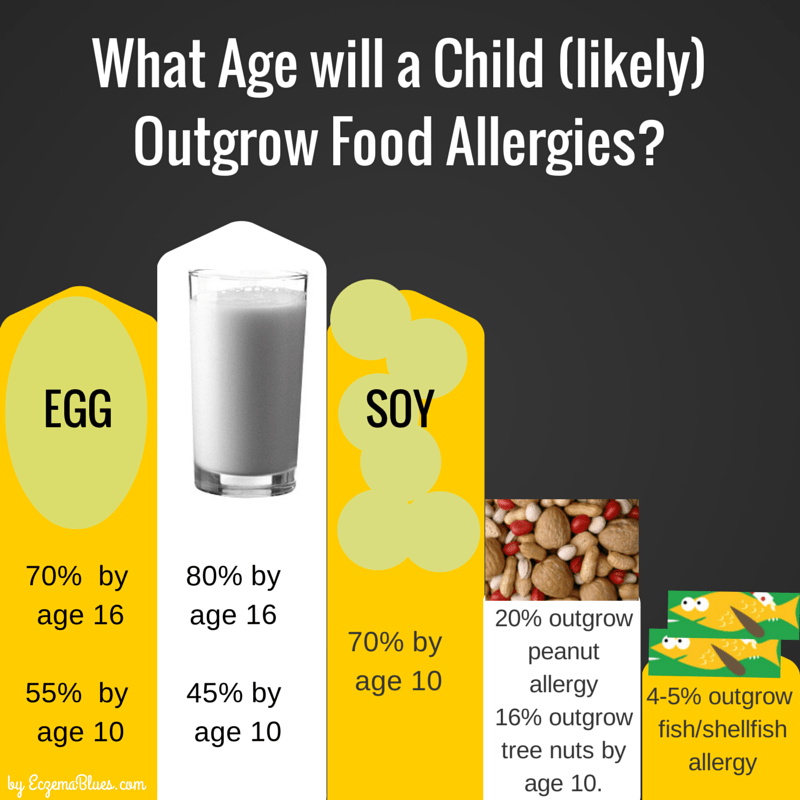 OUTGROW FOOD ALLERGY! It’s definitely not scientific because each study/report has a different focus but just to save time for you (paranoid moms and dads who would try to do the same), I figure I might as well make an attempt! While reading up on outgrowing food allergies, I’ve found some interesting food allergy facts! Fact #1 Shellfish allergy onset later in life (6 years and older) and usually lifelong. Same for fish allergy. Fact #2 Shellfish allergy IS NOT THE SAME as fish allergy. Fact #3: Shrimp, lobsters and crabs are more allergic than mollusks such as scallops, oysters, clams and mussels. Fact #4: Allergy to one type of (fin)fish does not mean allergic to another BUT study in 2004’s Journal of Allergy and Clinical Immunology found that 30% of children and approximately 66% of adults reacted to multiple types of fin fish. Fact #5: More women than men are allergic to fish (0.6% vs. 0.2%). Fact #7: You can be allergic to either egg white or yolk or both but avoid the whole egg as it’s not possible to ensure clean separation. Fact #8: Eggs and Milk cooked under intense heat (say baking cakes) seem to be more well-tolerated but don’t experiment without doctor’s advice (study here). Fact #10: Highly refined soybean oil (not cold pressed, expeller pressed, or extruded oil) and soy lecithin is usually tolerated by people with soy allergy. Fact #11: Food allergies developed from young (except peanuts, tree nuts, shellfish and fish) are more likely to be outgrown versus food allergies developed as a teenager or adult, which tend to be lifelong. Fact #12: 26.6% of children outgrew their allergies by age 5.4. Fact #13: The more severe the allergic reaction, the less likely to be outgrown. Fact #15: Boys are more likely to outgrow allergies than girls. When researching for this post, I actually found quite a number of websites carrying misinformation or unclear information where it’s either proven wrong in later studies (for instance, to delay introduction of foods) or information relating to intolerance being grouped as food allergy information (such as only larger amounts of food trigger a reaction). Another ‘sad’ news is that there is a study that children can develop a second (different) reaction to foods that they have outgrown. This is a study on Eosinophilic Esophagitis or EoE where it was found that 17 out of 1,025 patients in the study had initially outgrown IgE-mediated reaction to the foods but now suffer from EoE reaction (see AllergicLiving.com for their interview with the researchers of the study). EoE is an inflammation at the esophagus due to increase of eosinophil cells, leading to narrowing of the esophagus. Hope whatever age your child is, your family is managing the food allergies well. Share your outgrowing age below! Eczema Camp for Singapore Kids on 28 Nov! Thanks Dr B, yes, it’s all very complicated and recently, I am suspecting that I have food intolerance – a mystery indeed! Allergy, atopy and anxiety are all “A” words, and for understandable reasons, they often go together. In clinic we advise it is fortunate that, for most children with atopic eczema, what is eaten is not important. It is true that active eczema can worsen with certain foods but this is not allergy – it is a non-specific toxicity. Once the skin has healed the food can be eaten again without any problem.